If students learn these poems by heart and recite them to each other, they will never repeat those "silly" mistakes with "make" vs. "do" anymore. Make an effort and you will see that you will feel far more comfortable speaking English. 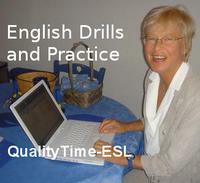 Additional poems with worksheets and keys are to be found in DOC in QualityTime-ESL: The Digital Resource Book Version 2.0.